Temporary freedom from work? Check. Lack of funds can often derail travel plans or even make the idea of travel seem daunting. Fortunately, you’ve come to the right spot. Welcome to HotMama’s Money Saving Tips, where you don’t have to have a big income to travel like you do. Here are my top 5 money saving tips. This is your ticket to free stuff like airfare, rental cars, hotels, etc. Many hotel chains, airlines and restaurant chains have reward club cards that are free to sign up, but yield really awesome perks and exclusive deals. These cards are offered by restaurant or hotel groups. They are usually free to sign up and you simply earn rewards every time you dine or book stays with their brand. Basically, you gain things for your travels when you buy everyday things or simply signing up with your email address. For instance, my Mlife card is my golden ticket to Las Vegas. I earn points when I gamble, when I eat and when I stay, resulting in extremely reduced room rates as well as food, drink, gambling credit and discounts. You can see how useful these rewards are on my Las Vegas post, HERE. I think I am signed up with every hotel and restaurant rewards group there is, because they really are beneficial to saving money. I often get free meals and free stays, adding up to hundreds in savings. In fact, I will be using and earning major rewards with Best Western Plus this summer as we travel the country for two months! Stay tuned for more information on that big adventure. Credit cards that earn you airline miles are great and have saved me a ton as I jet set around the world with my big crew. Now, the key is not to get in trouble buy getting your balance larger than you can pay-off. I know, it is tough for me too. What you want to do is use your card with the best rewards like a debt card, but only spend up to what you actually have in your bank account, not you available credit. This way you can earn rewards by purchasing the everyday necessities you had to buy anyway and the pay the balance off at the end of the month with you actual money from you checking account. This keeps you out debt, but the perks rolling in. Also, pay attention to bonus miles promotions. 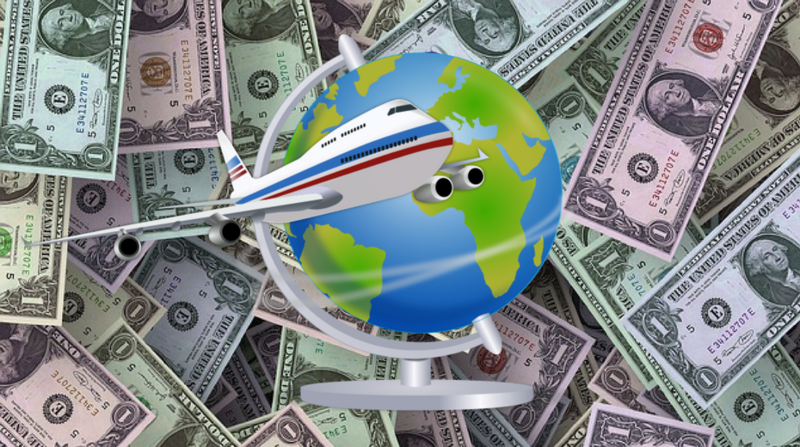 You will be surprised how fast you can earn free flights. If you plan on traveling internationally, getting a travel card that has zero foreign transaction fees. What is a transaction fee? Well, most credit cards charge 3% every time you use your card in another country. It sounds small, but it can add up. When I travel aboard I don’t even bring cash. Instead, I use my card and avoiding having to convert cash or deal with transaction fees. For more information on choosing the right travel credit card for you, I recommend checking out Nomadic Matt, HERE and The Points Guy, HERE. Why spend more on your flight if you don’t have to? Airfare is expensive, but there are ways to save. On SkyScanner you pick the flight you want and set the price you would like to pay. Saving you time from constantly checking your flight, you will be alerted when your flight has reached your ideal price. Google Flights is my obsession. I actually learned about it from Nomadic Matt, HERE. He has great tips for traveling for minimal costs. Okay, back to Google Flights. This tool allows you to check a variety of airlines at once as well as alerts you if flying in or out on a different day or time will save you money. This allows to adjust travel plans to save on airfare. You can also check the calendar to find the cheapest dates to fly. I LOVE it! I can’t even tell you how much I have saved by traveling during the week and silently during off-season. If you travel at the beginning or the end of off-season, the weather is usually great, the crowds are gone and it’s just a much more enjoyable experience all around for a fraction of the price. For instance, we saved a ton sailing on Disney Fantasy by traveling towards the end of off-season. To read more about on cruise experience, see my post, HERE. These sites are great, because you save money as hotels, cruises, etc. need to fill rooms. Kayak.com allows you to check multiple sites at once, allowing you to save money and time. VacationsToGo.com is the only site I use to book cruises. I’ve used them for years. I trust them and they have saved me up to 80% on cruises in the past. That’s why I am a cruise junkie. Travel Pirates are amazing and help you find the best update travel deals available. Research does wonders. I look up most (if not all) the restaurants online before I visit a location. I like to hunt for places that have awesome reviews, that are family-friendly and that have great happy hours, specials or coupons. Another way I save is by splitting meals. So often my eyes are bigger than my stomach and I order too much, but I have learned to split first and if I’m still hungry then I’ll order more. I make my kids split too. It is better to order more, if needed, than to get stuck paying for food they hardly touch. This method typically saves me up to 50% of my typical dining cost. In that same respect, we don’t eat three meals a day in a restaurant. We will have a late breakfast/early lunch combo and which gives us more money for a fantastic dinner. We also try to book hotels that offer complimentary breakfast. Just saving on one meal a day can keep a lot of money in your wallet, especially if you are traveling for an extended period of time. Plus, some hotels offer great hot breakfasts, not just continental. Check out our incredible breakfast service at The Kirklee Hotel in Glasgow, HERE. The bottom-line is that travel doesn’t have to be expensive to be amazing. It is really about doing your research, using the right sources and planning around your budget. If done right, it is quite possible to travel for next to nothing. So no more excuses! Back your bags, grab the kids and go! What money saving tips can you share? Google flights, eh? I’m going to have to check that out! Careful it is addicting. Hehe! Great tips, im going to check them out. Love reading your blog. I picked up a few tips from this post, much appreciated. Great! You are welcome and thanks for visiting! Seriously, food ends up being some of our biggest expense and because it is not something we pre-book we forget to add it to our budget. Sign me up for Awesome Stuff!